MANILA, Philippines – Filipino Catholics will have a chance to venerate a piece of cloth bearing what the faithful believe is an original imprint of the face of Jesus Christ. Known as the “The Holy Face of Jesus from Manoppello,” the veil will be in the Philippines on September 10 to 17 directly from a tour of the US West Coast and Las Vegas, according to a post on the website of the Catholic Bishops Conference of the Philippines. Also called “The Veil of Manoppello,” it has been housed for 500 years in the Capuchin Friary in Abruzzo, Pescara, near Rome. The veil has drawn pilgrims to the obscure hilltop village following the visits of then Pope Benedict XVI to the shrine early in his pontificate. “These papal visits have since called attention to the veil’s significance in the history of Christ’s life on earth,” according to the CBCP post. It added that Pope Emeritus Benedict XVI was reported to have been drawn to Manoppello after receiving the first printed copy of The Face of God, a book by German author Paul Badde, which covers 10 years of intensive studies on the veil by professors, scientists, iconographic experts, and authorities of the Catholic Church. * The veil—measuring a mere 7 x 10 inches—is dated between the time of the Christ’s Crucifixion and the Resurrection. 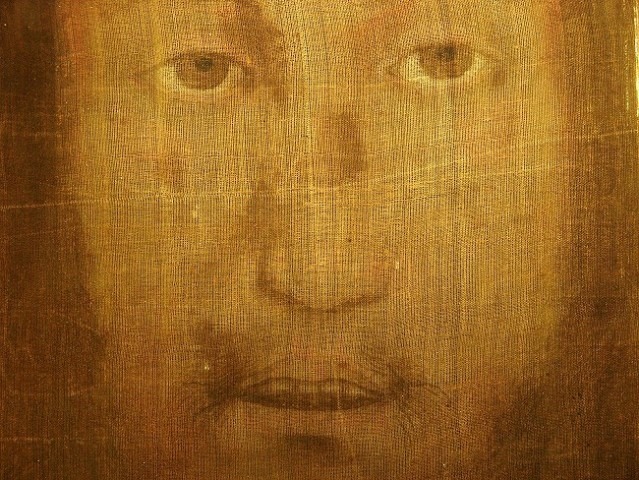 * The Shroud of Turin shows the image of a man with closed eyes and fresh wounds, while that on the Manoppello veil features a face with open eyes and closed wounds. For a list of times and places see the full news account. Categories: News & Views Tags: Manoppello, Philillines. From this article in the Filipino media, it would seem that the Veil itself will travel there. Far from it. Not the Veil but father Carmine Cucinelli, prior of the Manoppello sanctuary, is going to Manila and other places in the Philippines. In the meantime he is visiting the States (Seattle, San Francisco, Las Vegas). And not a single press release in English, the most popular language in the U.S.. I found two stories, after the fact, in Italian. Putting an announcement on a blog page doesn’t work all that well in getting it into the news stream. A simple press release distribution does. 1) I see no similarity whatsoever between the features of the Man of the Shroud and this image. None. The eyes of the artifact under discussion are very much in harmony with the Siennese school of painting, the hooded, almond shaped eyes in vogue in religious paintings in the 1200s. The nose is poorly done, and is in fact out of the alignment with the mouth. This image’s face reflects no injuries nor bloodstains associated with the Crucifixion and in fact does NOT represent a Semitic man! Any claims made to be ‘not made of human hands’ the Shroud of Turin has supported with scientific evidence, the most modern equipment being unable to refute this just and supported claim. What does science say of this artifact, and who says it? John Iannone, The Veil of Veronica: Fact or Fiction? For more sceptical view, see Roberto Falcinelli’s “The Veil of Manoppello: Work of Art or Authentic Relic?” from the 3rd International Dallas Conference on the Shroud of Turin (2005). Thank you, and I did check out your most scholarly work. And I know what I write will probably not make sense, but I have to say that when confronted by both images, there is just not the same feeling. The quiet holiness of the Man of the Shroud fills one with peace, in spite of the obvious violence inflicted upon the body. The face of Manopello seem to me to be disquieting, emotionless, well-done to the point of absolute virtuosity, and very inhuman. I can, and have, looked at the face on the SOT, for hours, and feel the closeness of God, and there is something in the Manopello face that makes my skin crawl. Those hooded, emotionless eyes, a face supposedly battered beyond recognition, is somehow there in perfect composure, hardly a hair out of place, no beard pulled out as the Scriptures say, no blow on the face from “Prophecy! Who struck thee!” nothing evidenced on the SOT, where every single blow and bloodstain finds perfect Scriptural confirmation. The Man of the Shroud is a bloody, battered mess, what one would expect a victim of Crucifixion to look like. And where, exactly, does a poor Hebrew woman get byssus? Not impossible, but I never got the impression the better classes of Judea attended the crucifixion processions of criminals. There are miracles and miracles. An opinion based on an emotion is not going to sway anyone either way, but for me, personally, my gut is telling me this is not a picture I want in my home. No reflection on your masterful work of course, I speak of a very subjective feeling of something being ‘not right’ on a level I cannot understand. But for now, I am listening to my gut. We have been looking at similarities (or supposed similarities) between the Manoppello veil and the Shroud quite recently, and a quick search through this blog will show you both sides of the argument quite well. O.K.’s overlays are interesting, but, in common with many others, have failed to convince generally, and such Science as has been carried out has not been sufficiently well reported to sway either side in favour of the other. Around three years ago I told people who were studying the Manoppello veil from close that one of my doubts was precisely that the veil seems to be in vogue with paintings during the period. Another big doubt is the cloth: is it linen or byssus? If it is byssus then both sides should be exact, there should be no differences, however we are told there are slight differences. Then, brush strokes are said to have been identified in some places, where paint and not dye were used. So, is it linen? The transmission spectroscopy is the solution. Why I.N.O.A. (Italian National Institute of Optics = http://www.ino.it/en/ ) and others had not followed that simple way ? Jaworski indicated the presence of melanin (= “Properties of byssal threads, the chemical nature of their colors and the Veil of Manoppello”. IWSAI 2010), but (if I am right) he doesn’t indicated the spectral answer of melanin because the scientific tools used (in that study) were HPLC and PLM. Unfortunately we don’t know how are the spectral lines because there is a lack of data that we must try to fill with the inherent control. What kind of spectroscopic studies ? Reading the text by Jaworski we don’t know what were these controls ! Have you found the inherent reference ? I admit : I was too harsh in my words against prof. Jaworski. and so… I became too rigorous against Jaworski! Have you tried to see what are the transmission curves for linen and silkmarine? See also the presence of a glass, a question to solve with adequate calibrations. What are your comments ? > – the Manoppello image is on byssus (= silkmarine byssus). Unfortunately we were not able to obtain the inherent spectral data ! Manoppello’s Face ! Why ? different kind of painting or colouring systems !). Josie, I do understand your emotional reaction upon looking at the Holy Face of Manpello. When I first downloaded it and looked at it I was quite discomfitted. The eyes seemed to be staring right through me, but I couldn’t tear myself away. I figured if I were truly gazing upon the face of Christ, who sees into my very soul, it should make me a bit uncomfortable. Still–how many different photos of the Face have you seen? The face looks quite different in various lights and angles. Aparently this is even more so when viewing the image itself, but even photos show striking differences in expression. There are scores of photos of the image available on the internet. In some he looks stern, in others peaceful. Even if you gaze at the Face for a significant time the expression changes subtly.